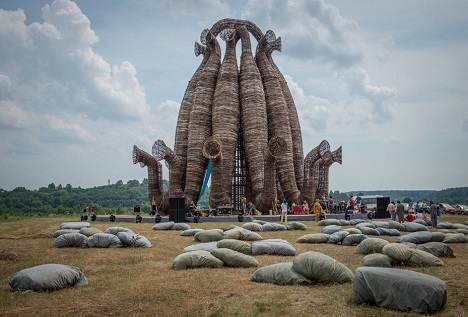 The Nikola-Lenivets village, which has been transformed into an artists' colony over the last decade, will host Archstoyanie, a three-day festival of architecture and art. The four dancers hurled themselves at each other in a field as a small flying camera buzzed around them. Moving toward the end of the piece, called ‘Horse,’ a real horse neighed impatiently nearby. Dancers, hip DJs, a brass band in onesies, French bards and spoken word performances came together at Bobur, a one-day festival at Nikola-Lenivets, a village located four hours' drive from Moscow that is a mecca for artists and architects. The centrepiece of the fest was a new installation, a giant 22-metre figure made out of beech trees. A stage was set up at its base and performers looked as if they were playing in supplication to the creature behind them. The village, which has been transformed into an artists' colony over the last decade, will host Archstoyanie, a three-day festival of architecture and art, from July 26 to 28. Land art installations dot the beautiful countryside around the village. In one spot, a vast wooden structure called Mayak, or Lighthouse, stands in front of the river Ugra. Like the best of the installations, t looks as if it has been there since the dawn of time. That piece, like Bobur's, was the work of Nikolai Polissky, an artist who moved to Nikola-Lenivets, which translates as Lazy Nick, in 1989. New installations go up each year for Archstoyanie, but not all of them remain, with some going up in flames at the end of the festival. One of Polissky's most famous structures was a huge two-headed eagle made of metal that belched smoke and fire on the eve of the presidential elections in 2012. Bobur was inspired by the Centre Georges Pompidou, also known as Beauborg, or Bobur in Russian, the name of the area in Paris where the art museum is located. The structure plays on the museum's pipe-like creations that emerge out of the ground. “We took this element to show that we're in dialogue with world architecture. We are not doing something distinctly Russian,” Polissky said. Bobur has instantly become part of Nikola-Lenivets. “It doesn't look like anything else. Some say that it is a saxophone, others say the skin of a giant beast, but when I am here alone in the fog, it is like a giant space ship,” said Polissky. Special buses will run from Moscow to Nikola-Lenivets for Archstoyanie (arch.stoyanie.ru). There is still time to take part in the festival as a performer, too. One of the shows will see more than a dozen poets read their poems for an hour to one solitary listener in Alexander Brodsky's rotunda, a charming structure that sits in the middle of a field.